Love is like the wind… you can’t see it, but you know it is there because you FEEL it. Love is an incredibly powerful force; it transcends language, time and place and brings hope and healing to those going through challenges. The love in our hearts serves as an invisible yet tangible connection to those we care about… no matter where we are in the world. So let the light of the love in your heart shine forth! Last week I mentioned that I’m going to be developing a new website, and asked if you enjoy reading the blog, but haven’t subscribed yet, to please take a moment to Subscribe to the Zenspirations® blog so we’ll be able to stay in touch no matter where I wind up hosting the website. THANK YOU to those who took a few moments to subscribe, and WELCOME to all the new subscribers! If you are a new reader (rather than a new subscriber), the Zenspirations® blog is where I share inspirational images I’ve been working on, along with accompanying uplifting messages. Since the blog is popular with my fellow ‘Creatives’, Crafters & Calligraphers, I occassionally share technique tips. And every now and then I ask what you’d like to see, and then create something especially for those of you who leave a comment. Although it will most likely be several months in the making, I’m really looking forward to my new website, so rather than you just reading what I post and me reading your comments, we’ll actually be able to converse. Martine requested the word ‘AMOUR’, which means LOVE in French. Love in any language is a beautiful thing to share. I was touched at how many people requested cards for specific people in their lives… and it was REALLY hard to decide how to accommodate as many requests as I could. In the end I came up with three cards that will hopefully meet most of requests: You are Greatly Loved; To a Very Special Friend; and a heart dangle with the LOVE from last week’s blog. Since I couldn’t create cards for every imaginable relationship, I did what I thought was the next best thing– I left room in the design below for you to add someone’s name. You could write “Mom” above “You Are Greatly Loved”… or “Son” or the name of the person you are making the card for. And I left a space for you to sign your name on the back of the card. If you haven’t made your own cards before, print it out, score it, and then cut it. In addition to adding color, you can add glitter, gems and whatever embellishments you like to use. 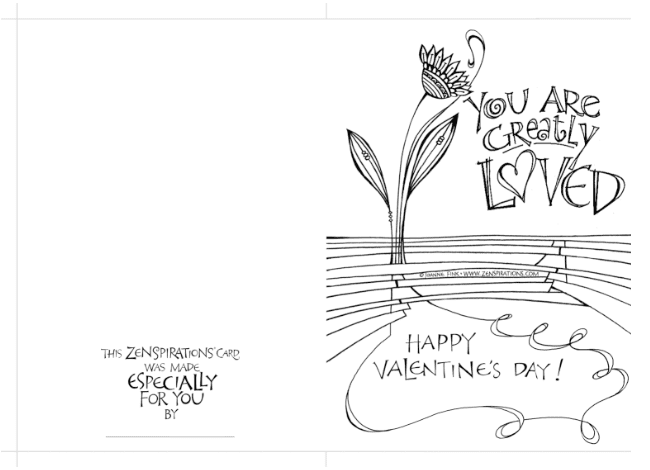 Click here to download a pdf of the “You Are Greatly Loved” card. When you get to the page, right click the image to save a copy. 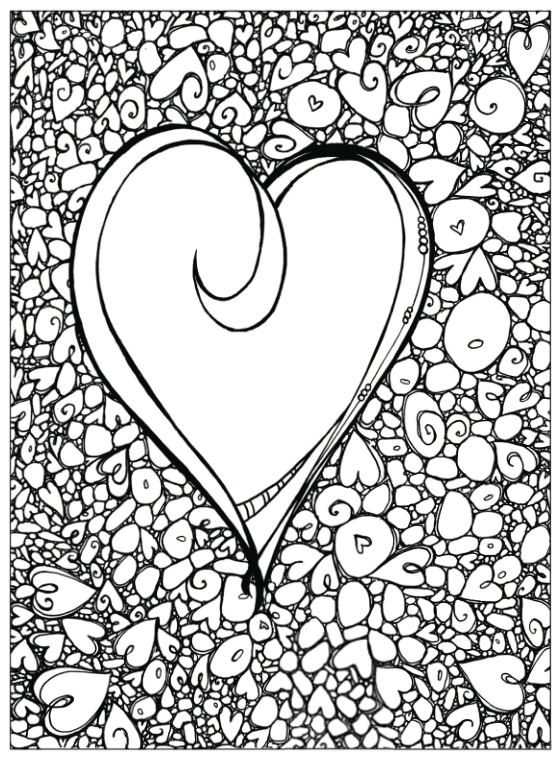 On the card below there is room for you to add someone’s name in the swirl between the two hearts. 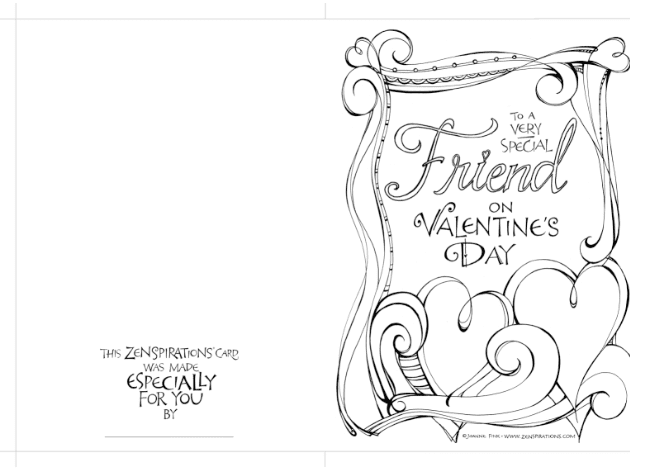 Click here to download a pdf of the “Special Friend” card. When you get to the page, right click the image to save a copy. If you have some extra time this week, please consider making a card for a friend, family member, neighbor or co-worker who has experienced loss. Valentine’s Day can be especially difficult for widows, divorcees and other people who are alone. A card, a flower, a phone call, even a FB message or text could make a BIG difference to someone you know. Please reach out in love, and touch someone’s heart. You’ll be glad you did! 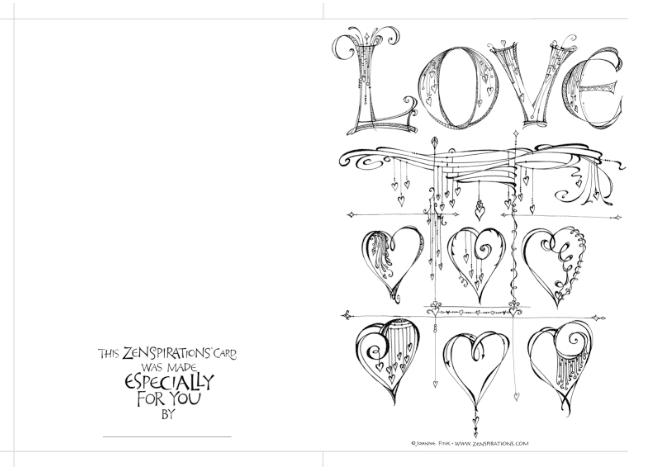 For those of you who prefer a coloring page, I spoke to my editor at Design Originals, and she gave me permission to share a couple pages from my Zenspirations Color, Create, Pattern & Play books. So I picked two pages from the Zenspirations Inspirations book, and two pages from the Zenspirations Abstract book (see photo below). The first two are from the Zenspirations Inspirations book. 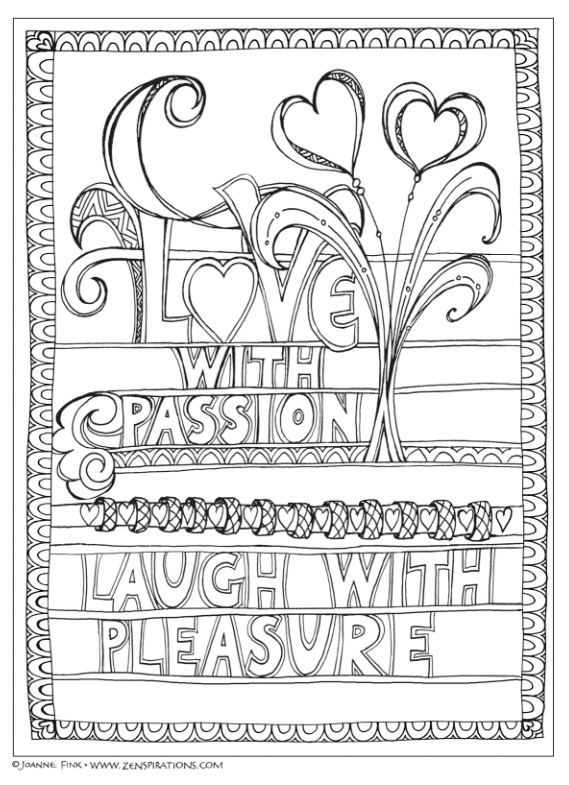 Click here to download a PDF of the Zenspirations Love With Passion page from the Inspirations Color, Create, Pattern & Play book. When you get to the page, right click the image to save a copy. Click here to download a PDF of the Zenspirations Woven Frame page from the Inspirations Color, Create, Pattern & Play book. When you get to the page, right click the image to save a copy. 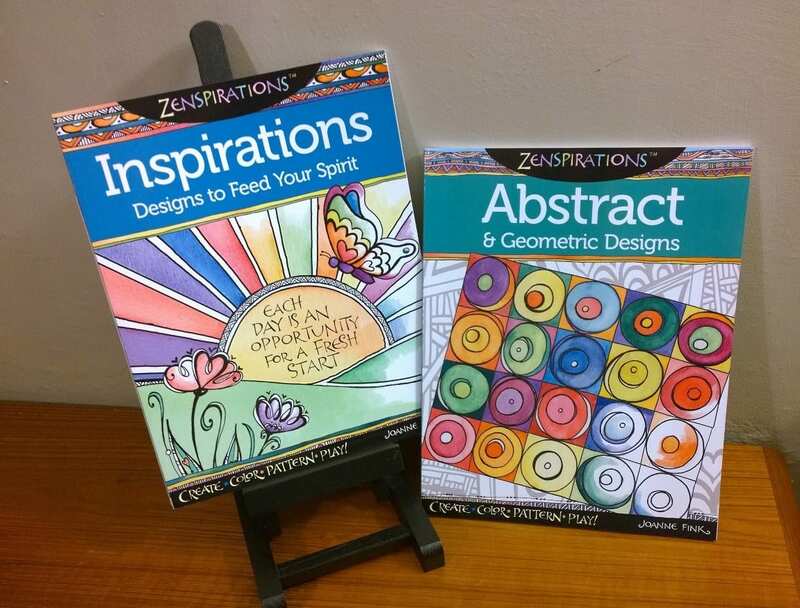 The next two are from the Zenspirations Abstract book. 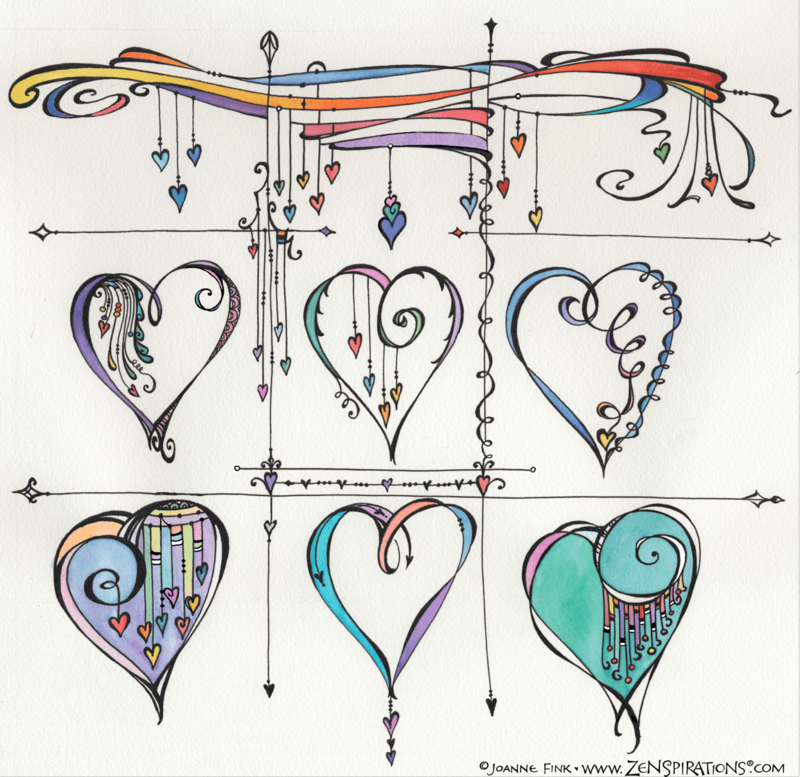 Click here to download a PDF of the Zenspirations Loopy Hearts page from the Abstract Color, Create, Pattern & Play book. When you get to the page, right click the image to save a copy. 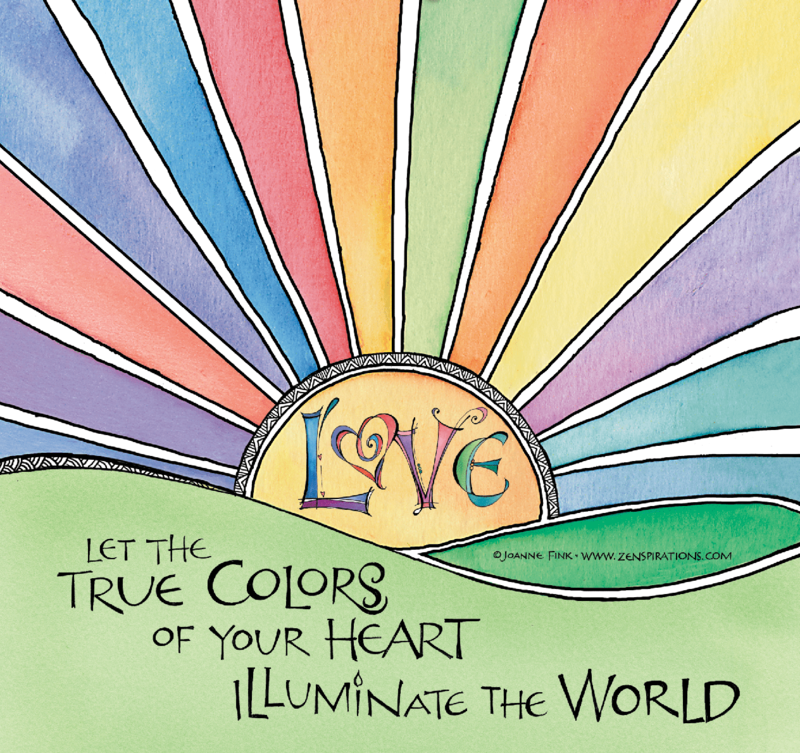 Click here to download a PDF of the Zenspirations Rock Hearts page from the Abstract Color, Create, Pattern & Play book. When you get to the page, right click the image to save a copy. Have fun coloring! Experiment with different tools and techniques, and please take photos and share them with me. I look forward to seeing how your pieces turn out; my e-dress is joanne@zenspirations.com. Happy Valentine’s Day– hope you get to spend it with someone you love! I just found out that PC users couldn’t see the visuals of the coloring pages and cards, and wanted to let you know that I’ve fixed the problem. Below is a photo I posted to Instagram today showing the pieces you can download. If you are on Instagram, and want to see what I post, either click the “Follow Joanne on Instagram” button on the left side of my website, or try www.instagram.com/zenspirations/. Your work is so beautiful and inspiring! Thank you so much for sharing your amazing talent. Thank you so much for sharing some of your amazing pages with us. I just bought 3 of your books and can't wait to get started! Love your designs. WOW!! Thank you SO VERY MUCH, Joanne, for the lovely gifts!! I have "discovered" you recently and have been enjoying your videos and all the sharing you so graciously offer!! In this day when so many are trying to make a buck from everything, I so deeply appreciate your heart that so willingly gives to encourage others!! Thanks so much, Joanne! Your generosity is incredible! These are INCREDIBLE!! THANK YOU SO MUCH!! I love all your 'work' (I hate to term it that because it is too beautiful to seem like 'work'). I love these! Thank you so much for sharing them with us. Thank You so much Joanne. These are amazing. 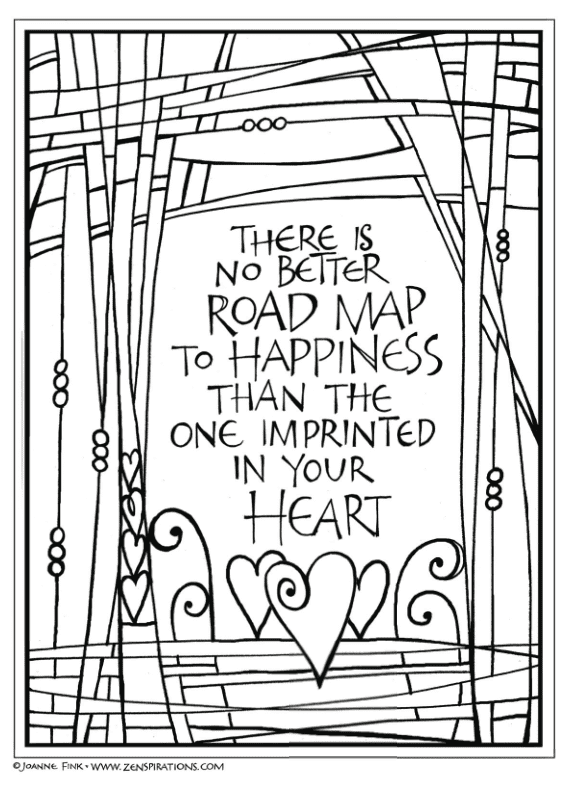 The woven hearts full page is going to be my title page for a year long journaling course. Thanks so much for sharing your beautiful work with us. I think I will share this with my sister who lost her husband last year. Thanks!! Happy Valentines Day!! Thanks Joanne, these are wonderful ! Thank you so much ! You have made my day with your generosity. Happy Valentine's Day! Thank You so much for your inspiration and beautiful art. THANK YOU Joanna for your precious kindness in sharing all of these beautiful printables. They are all amazing and will be make treasured keepsakes I am sure. Warmest best wishes from across the miles in here in France. Thank you, Joanne, for your beautiful and generous sharing. I love you designs. 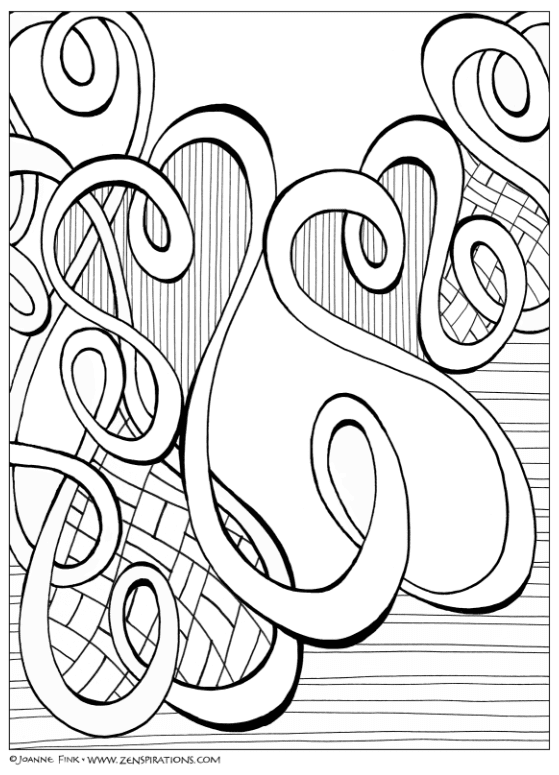 I'm new to Zentangles and part of why I join the world of tangling is because I saw your work on Pinterest. I'm learning more all the time from following you and watching your videos. Thank you again. Wow!!! Thank you so much for the Valentines cards and for the wonderful pages from your new books!! I look forward to adding the new books to my Zenspiration library!!!!!!!! Thank you so much for the free cards! You have blessed my day! Thanks so much! These are just wonderful!